Taper talk is rife again in the financial media. And the all-too-familiar consensus is still that the Federal Reserve will abandon cheap money in the near future, driving up interest rates and sending dividend-paying stocks plummeting. Treasury investors have treated this as a done deal. The yield on the benchmark 10-year Treasury note has soared by more than 55 percent thus far in 2013. And the impact has been felt in the rest of the bond market as well: Coupon rates on freshly minted investment grade bonds have risen as much as 100 basis points since the spring for some longer-dated issues. Even shorter dated paper has slipped a notch. The iShares Utility Bond Exchange Traded Fund (NSDQ: AMPS) is off about -5.5 percent this year including interest payments. It’s impossible to say how much of a tapering off of Fed bond buying has already been priced in for bonds. The 10-year Treasury yield, for example, generally fluctuated within a range between 4 and 5 percent for several years prior to the crash of 2008—before heading to a range between 1.5 and 3 percent the past five years or so. That 4 to 5 percent may indeed be a normal level to which the 10-year yield will gravitate back. But the Fed under soon-to-be Chairman emeritus Ben Bernanke never wavered in statement or action that central bank bond buying would continue until economic conditions quantitatively improve. And that policy is unlikely to shift, even in the now extremely doubtful event that Janet Yellen’s nomination to replace him is blocked. Inflation by Fed reckoning is certainly not high enough to justify a move until the economy shows enough strength. And the one step forward half step backward pace of this recovery shows no sign of shifting to even a robust forward walk. US industrial output, for example, returned to pre-2008 levels in September. The better-than-expected 0.6 percent sequential gain from August, however, was at least partly due to weather. Manufacturing in contrast was up just 0.1 percent. There’s considerable reason to be optimistic about some sectors of US industry and manufacturing. Petrochemicals, for example, are seeing a renaissance, particularly on the US Gulf Coast, thanks to cheap US natural gas and a massive boom in oil production. For example, power utility Entergy Corp (NYSE: ETR)—which serves a swath of territory in the Mid-South including parts of Arkansas, Louisiana, Mississippi, Texas and the City of New Orleans—added 3.2 percent more industrial customers to its rolls in the third quarter. And cheap energy is fueling manufacturing expansion in other parts of the US South as well. Given how long it takes to construct or even rehabilitate large facilities, however, this is likely to be a slow build for the economy. And in the meantime, any Fed-led spike in interest rates would make it harder to finance and push new projects forward. Consequently, there’s no real reason to expect a sudden change in Fed policy that would push interest rates markedly higher near-term, other than a vague idea that conditions must at some point inevitably return to “normal.” That situation has frustrated the Taper Trade this autumn, and looks set to going forward as well. The real irony is that no matter who is right on the Fed/Taper question, odds are it won’t matter one iota for owners of dividend paying stocks. That is, it won’t unless we subscribe to popular delusion that paying a dividend makes a stock a bond substitute. Take a look at my table “What’s Rate Sensitive.” I’ve listed year-to-date total returns (through November 14) for eight stock indexes and two bond indexes. The first takeaway from the data is that this has been by any measure a year of rising interest rates. The TNX Index represents the yield on the 10-year Treasury note, considered a benchmark interest rate for bonds worldwide. This year, it’s risen by more than 55 percent from where it ended December 31. That’s one of the more dramatic jumps in history. The rise in the TNX is wholly due to the up-to-now unfounded speculation the Federal Reserve will stop supporting lower interest rates by buying bonds. Treasurys are the world’s most liquid and easily traded bond market, making them a perfect vehicle for this kind of bet. And whenever taper talk reaches a crescendo, we can expect more of the same action. What’s remarkable, however, is the lack of response in stock sector indices that according to conventional wisdom are interest rate sensitive. In fact, with the exception of the Canadian REIT-heavy S&P Toronto Stock Exchange Income Trust Composite, all of them are up double-digits with only about six weeks to go in the year. Returns have lagged those of the S&P 500, as they usually do when investors gravitate more toward growth. And there have been some notable selloffs, particularly in May when Taper talk was starting to lift off. Nonetheless, the year’s trajectory of all but one index has definitely followed that of the overall stock market, even in the face of a dramatic rise in interest rates. Moreover, the top performing of the stock indexes is the one that theoretically should have been the most interest rate sensitive. That’s the MLPY—Morgan Stanley Cushing MLP High Income Index—and ETF representing the highest yielding sub-segment of the master limited partnership universe. These MLPs yield well above average (Index yield 7.8 percent), primarily because they face challenges that have stalled distribution growth. Theoretically, that should make them more vulnerable to rising interest rates. Yet as a group, these MLPs have tracked stocks and basically ignored the action in bonds. And their solid performance comes despite unprecedented “bear raids” that temporarily drove down prices for several of their number, notably Linn Energy (NSDQ: LINE) earlier this year. The only two indexes on this list that are underwater for the year are the iShares Utility Bond ETF (NSDQ: AMPS) and the S&P TSX Income Trust Composite. The former holds a collection of bonds issued by utilities and other owners of essential service assets. That it’s interest rate sensitive should surprise no one, though the ETF’s ability to hold down losses is a testament to the structure that combines near-term maturities with improving credits. Turning to the Income Trust Composite, part of its problem has been the Canadian dollar. The Loonie’s long-term appeal is undimmed as a currency backed by a fiscally responsible government and resource wealth. But like most currencies this year, it’s lost ground to the US dollar on the basis that tighter money policy is coming to America. As I point out in the most recently posted issue of Capitalist Times, Canadian REITs offer compelling value, as rising earnings spur a return to regular distribution growth. The best of the bunch yield twice as much as US REIT and are operated far more conservatively as well. And most now sell for barely book value. That’s another stark contrast to the typical US REIT, which trades for twice book and often a lot more. To the extent that rising interest rates strengthen the US dollar, Canadian REITs and most other foreign stocks will likely be interest rate sensitive this year—as their US dollar value drops. On the other hand, a recovery in the Canadian dollar will lift the US dollar value of unit prices and distributions paid. And these stocks and their home currency are arguably pricing in a lot more “tapering” now that is justified. As for the other five indices of dividend paying stocks—Alerian MLP, ARCA Super Oils, Dow Utilities, S&P Telecom Service and even the Bloomberg North America RIET Index—their ability to post positive total returns this year doesn’t mean every company in their sector has made money this year. It doesn’t mean they haven’t been volatile from time to time. And it doesn’t mean they won’t sell off whenever someone starts talking to the financial media about rising interest rates. What it does prove beyond a shadow of a doubt, however, is companies in these sectors have been making money this year, despite an environment of rising interest rates. And the key to that is simply company performance, just as it is for every other stock. The long and short of it: Bond prices will get hurt if the Fed tapers and interest rates rise. But dividend paying stocks are not bonds, and they’ve proven they can prosper when benchmark rates rise. 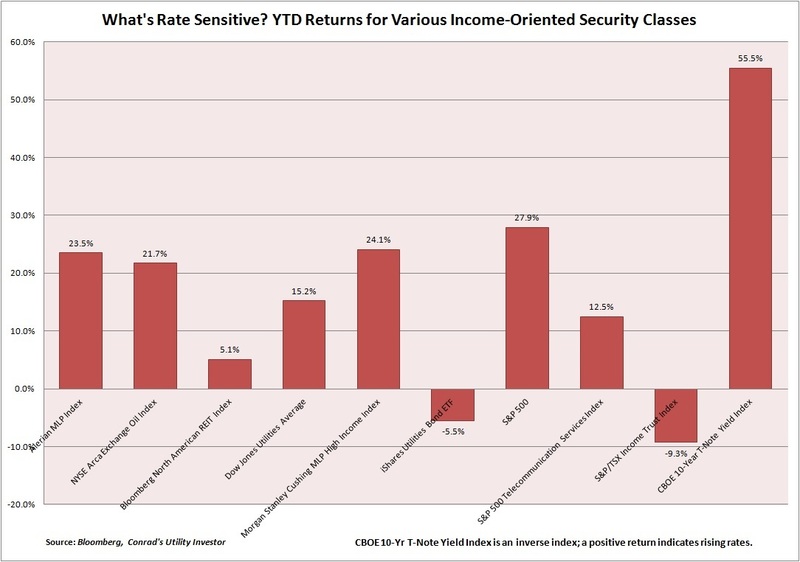 Worries about rising interest rates are, therefore, a very poor reason to sell solid dividend paying stocks. Sentiment swings can trigger volatility. But so long as your holdings are performing as businesses, they’ll bounce back. The numbers in my table don’t lie!